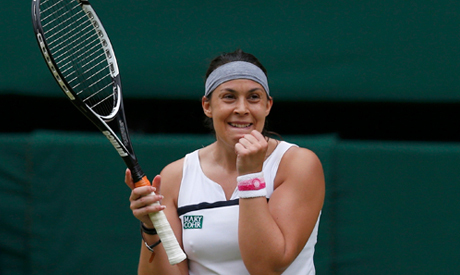 Marion Bartoli crushed Kirsten Flipkens 6-1 6-2 in an embarrassingly one-sided semi-final on Thursday to reach her second Wimbledon final. The French 15th seed completely outclassed Belgian Flipkens who failed to deal with the pressure of her first grand slam semi-final on Centre Court and was also hampered by a knee injury. Flipkens, seeded 20th, dropped her first service game and Bartoli broke again for a 5-1 lead before taking the opening set in only 25 minutes. Bartoli, who lost to Venus Williams in the 2007 Wimbledon final, made two early breaks in the second set before Flipkens received on-court treatment on her heavily strapped right knee. The 27-year-old Belgian immediately broke Bartoli's serve but the Frenchwoman broke straight back and sealed victory in just over an hour with a smash on her second match point. She will play fourth seed Agnieszka Radwanska or Sabine Lisicki, seeded 23rd, in the final on Saturday.